Home > Ask Our Experts > Can My Friend Pay His Cheque into My Account? My friend recieved a UK cheque with his name on, however he doesn't have a bank account. Can he endorse it to my name and could I put it in my account? “After section 81 of the Bills of Exchange Act 1882 there shall be inserted the following section—81A—(l) Where a cheque is crossed and bears across its lace the words "account payee" or "a/c payee", either with or without the word "only", the cheque shall not be transferable, but shall only be valid as between the parties thereto." Up until 1992, there was no reason why a person could not hand over a cheque, made payable to themselves, to someone else for them to pay into their own bank account. You simply had to write the name of the person on the back of the cheque and that was it – job done. However, as you can see from the quote above, the law has since been changed and now all cheques have to be crossed. 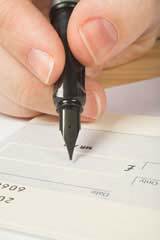 You will notice cheques now have crossing lines across them and the account payee printed across the front of the cheque. This move was done as a way to decrease instances of fraud. So, this makes it a risk on the bank’s behalf to accept a crossed cheque into the bank account of someone other than the name printed on the front and as a general rule of thumb, they just do not accept them. However, this doesn’t mean that there isn’t a way. Over the last decade a number of agencies have set up shop on the high street that say they will exchange a cheque for cash. Originally this was marketed as a way of people getting instant cash from pay-day cheques without having the wait for the standard three days. Of course, these agencies accept the risk that the original cheque could be fraudulent and as a way of counter acting this they tend to charge a fee, typically a percentage of the cheque’s value. If you do want to use one of these agencies as an alternative, then you will no doubt be required to provide some form of identification and also, you should find one that is registered with the British Cheque Cashers Association (BCCA). My Nan has given me a cheque, made payable to myself, she has written across the centre (across the crossed section) PAY CASH can I cash it at my bank RBS, she banks with the Halifax . Cheques won't be phased out until October 2018. My wife got fined for no tv liscence,and has been paying £20 per fortnight from our joint benefit caim, which is paid into my bank account as she hasnt got a bankaccount! Today she got a cheque from them for an overpayment! Can she put it in2 my account? My bf has been sent a.check.but only has a post office card account and cannot put it in. He also has no photo id. Can I put this in my.bank account? My son as 4 cheque sent to him but wants them in my bank account can i put them in my bank account. I have cheque with title of Cash, Can Itramnsfer it to my account as it is crossed with two parralel. Please guode me. My dad has received a cheque for my mums pension after she passed away. Unfortunately my dad doesn't have a bank account and no fixed abode so therefore no utility bill to open an account. The only account he has is a basic Post Office one and they said they will not accept the cheque totally nearly £9000. My dad is happy to pay the cheque into my my bank account. Is there a way he can do this even though it's been signed in his name. We will both be present when we go into the bank so would this be ok? I got a cheque in my name..and I wanna transfer it to my father account..is tis possibl..?? How can someone pay/Order money from his account with my name for other/ beneficiary? Only the account holder can take money from an account. How can someonepay/Order money from his account with my name for other/ beneficiary? @sammib5 - you can only pay it into the account the person's name on the cheque is in. I have a tex return cheque in my partners name but we want to pay it into my account am i able to cash it into my account? I received a check with pvt ltd co.name . however dont have a curunt bank account. How can i cash it? Can i pay in a large banker's draft i have been given as a gift thats not in my name?